This book is written to help you understand and manage your low back pain. Most people with lower back pain have recurrences of pain over years and decades. This book explains the investigations available for lower back pain (X-rays & MRI scans), postures required to preserve your back and treatment options. This book is full colour gloss and easy to read. 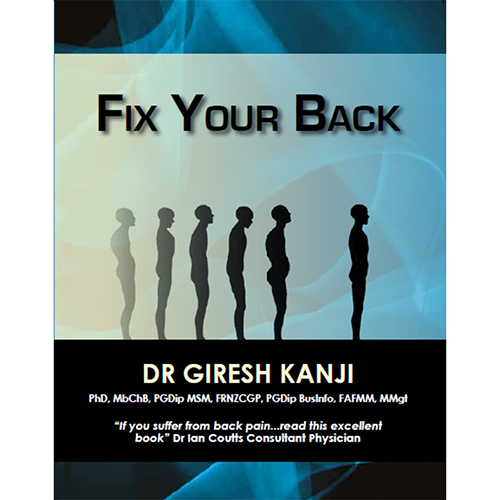 The second edition of Dr Kanji’s back pain book was printed in November 2013, after the first edition sold out. This is an excellent, easy to read book on back pain which is most suitable for people who suffer from back pain. It outlines the causes, investigations and remedies for lower back pain. The book is well illustrated with full colour diagrams explaining the structure and function of the lumbar spine disc, the most common source of low back pain. The writer gives eight golden rules for lower back pain which have been developed through a combination of scientific research and implementing the self treatments on thousands of patients who have suffered from many years of lower back pain, often with positive results. Over 5000 copies have been sold since first publication making it New Zealand’s fastest selling book on back pain in 2014. The author, Dr Giresh Kanji from Wellington, is a pain specialist and researcher.